A dental bridge is a fixed appliance used to replace one or more missing teeth. 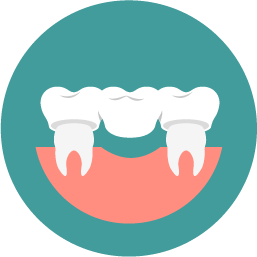 Placing a bridge can help avoid many issues that arise when a patient has one or more missing teeth. Once a gap is created due to tooth loss, the remaining teeth try to compensate by filling in the space by drifting or rotating. This drifting and rotating can throw the patient's bite off, causing TMJ (temporomandibular joint) problems. In addition, the imbalance created by missing teeth can also lead to gum disease. A bridge can also boost a patient's self-confidence. When someone is missing one or more teeth it can impact their speech, and even change their appearance. A bridge can help fix these problems that can occur with missing teeth. A bridge involves placing crowns on the two teeth on either side of the gap and closing the space with a pontic (custom-made false tooth/teeth). The two crowns on either side and the pontic are all fused together to make one unit. The first appointment is the longest. At this time the two teeth surrounding the gap will be reduced as much as necessary to accommodate the crowns. An impression is taken of the area where the bridge will be placed. This impression will be sent to our dental laboratory, serving as a model from which the bridge will be made. Lastly, a temporary bridge will be cemented for approximately two weeks, until the permanent bridge is ready. When you return for the final appointment, the temporary bridge is removed. The permanent bridge will be cemented, and any necessary adjustments will be made. There is one thing you must be aware of with a bridge: Cleaning it is different than with the rest of our teeth. Since the unit is fused together we cannot get in between the crowns with floss. In order to keep the gums healthy you must still floss! With a bridge, you actually floss under the pontic to remove any sticky plaque and food debris. Don't worry, we'll teach you!